Over 23 states have medical cannabis programs, yet some patients are still prescribed pharmaceutical replacements for weed. What is Marinol and how does it stack up to natural weed? Over 23 states have medical cannabis programs, yet some patients are still prescribed pharmaceutical replacements for weed. Marinol came onto the market in 2004 and has since been the go-to prescription drug for conditions that can be treated with THC. But, can the drug really stack up to natural cannabis? Marinol is a legal prescription drug that is basically man-made THC dissolved in sesame oil. The generic name for Marinol is dronabinol, and it’s considered a cannabinoid. As you can see from the pictures above, Marinol and THC are structurally very similar. Marinol, however, does not contain any natural plant-based THC. Rather, it is a chemical compound that was created using a standard drug manufacturing process. Sudden loss of appetite and changes in taste caused by the infection. An unwillingness to take proper HIV/AIDS medications. Lack of bodily ability to absorb nutrients because of the infection. Marinol is prescribed to HIV/AIDS patients in order to stimulate appetite and encourage weight gain. As it turns out, natural THC and other plant-based cannabinoids may be just an effective alternative for regulating metabolism and encouraging appetite (AKA the munchies). Chemotherapy is far from a walk in the park. Extreme nausea and vomiting are common experiences for nearly everyone undergoing this harsh medical treatment. Marinol is one of the drugs doctors can prescribe patients undergoing chemo to prevent upset stomach. Because of its strong side effects, however, it’s usually only prescribed after other anti-nausea medications have failed to work. Marinol has several major downsides when compared to natural cannabis. First of all, it’s a pill. If you’ve ever been truly sick to your stomach, then you know that keeping down a pill is no easy task. Inhaling marijuana vapor is an extremely fast-acting way to fight nausea without having to stomach swallowing a capsule. A nice cup of cannabis tea is also an effective way to fight painful digestive issues. You can either make your own or pick up a pre-packaged teabag from a local dispensary. As a quick pro-tip, canna-tea is a very discreet way to medicate while you’re inside a hospital. 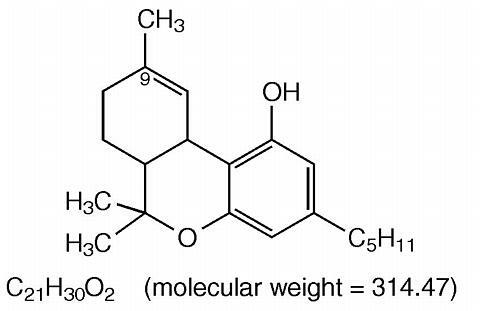 THC isn’t the only cannabinoid found in the marijuana plant. Other compounds like CBD are powerful analgesics, making cannabis a better choice for treating a wider variety of both HIV/AIDS and cancer symptoms than Marinol. This is not to mention the antioxidant and anti-tumor properties that have been found in the herb. …Marinol is simply not as effective for pain management as the whole plant; a balance of cannabinoids, specifically CBC and CBD with THC, is what helps patients most. Weed also contains a wide variety of healing plant-based terpenoids. Terpenoids are flavor and aroma molecules that are present in all plant materials. When you consume cannabis, you’re not only consuming powerful cannabinoids, but you’re also taking in flavor compounds that have additional medical properties. Linalool is one example of a healing terpene. Linalool is the reason why lavender has its unique floral scent. This terpene is also present in strains like Cannatonic and White Widdow. It’s notable for its anti-inflammatory and pain-fighting properties. Does Marinol Make You High? The short answer: yes. Very high. Marinol is actually a stronger psychoactive than natural THC. In fact, feeling “high”, hallucinating, and paranoid reactions are all side effects listed directly on the prescription handout given to patients. The fact that this strong psychoactive is legal is a little funny considering that natural marijuana is still listed as a Schedule I substance. According to DEA, the weed plant supposedly has NO medical value and has extremely high potential for abuse. Marinol, however, is listed as a Schedule III substance. Any drug that falls under the Schedule III category is considered to have less potential for abuse and more medical benefits than Schedule I substances. The FDA has recently weighed in, encouraging the DEA to reschedule natural cannabis. The DEA has yet to make a decision on the matter. This means that both HIV/AIDS and cancer patients in non-medical states are left with Marinol as their only legal option for therapeutic cannabinoids. The cannabis plant has been used as medicine since ancient times. Yet, our only federally approved option for cannabinoid therapy thus far is one that we’ve invented in a laboratory. The result is an incredibly strong psychoactive that cannot be used as holistically as the natural herb. This leaves patients in non-legal states short on options for medicines that may be more effective for their conditions. Have you or a loved one ever taken Marinol? How did the drug work for you? Share your experience with us on social media or write us a message in the comments section below. We’d love to hear your story!